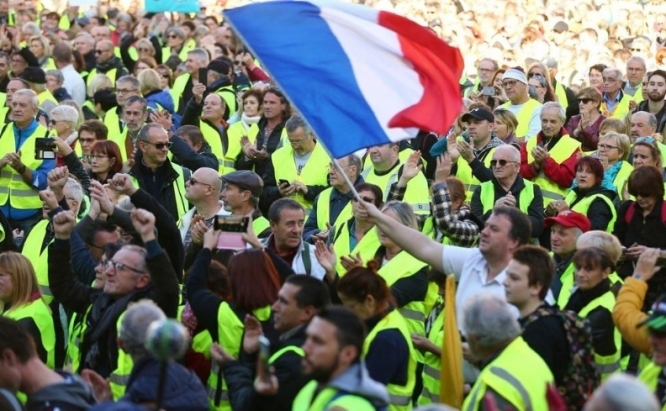 The Gilets Jaunes protests against rising fuel costs are continuing into their fourth day across France, as the minister for the interior condemns the movement as “no longer coherent”. Today (Tuesday November 20), protests were still continuing after the largest day on Saturday (November 17), with a number of motorways and petrol stations still blockaded by “Gilets Jaunes” - so-called because of the high-visibility yellow vests they have been wearing. In the Vaucluse, 200 heavy goods vehicles have been blocking the entrance to the A7 motorway for over 24 hours, with over 50 protesters continuing to maintain barriers in place. In the Gard, protesters are still in place on a major roundabout near Nimes, just at the entrance of the A9, but are allowing some vehicles through. In Corsica, demonstrators have now lifted their protest at the Marana oil depot, but have threatened further action soon. In Langueux, in the Côtes-d'Armor (Brittany), two scuffles broke out between protesters and police last night after a roadblock of 200 protesters was evacuated by law enforcement. Five people were arrested. Around 50 people returned to the same site overnight, breaking windows and causing further damage, but there were no injuries, according to police. Christophe Castaner, minister of the interior, has spoken of a “total drift” away from the original grievances of the protesters.